Why do we love leggings? This garment is one of the most versatile bottoms you can wear during Fall and Winter seasons. In today’s post, we are going to see all our favorite leggings designs to try this year. There are thousands of ways how to wear them in real life. You can pair them with elongated tees, or try them underneath skirts and shorts. Personally, I do like wearing them underneath frocks. 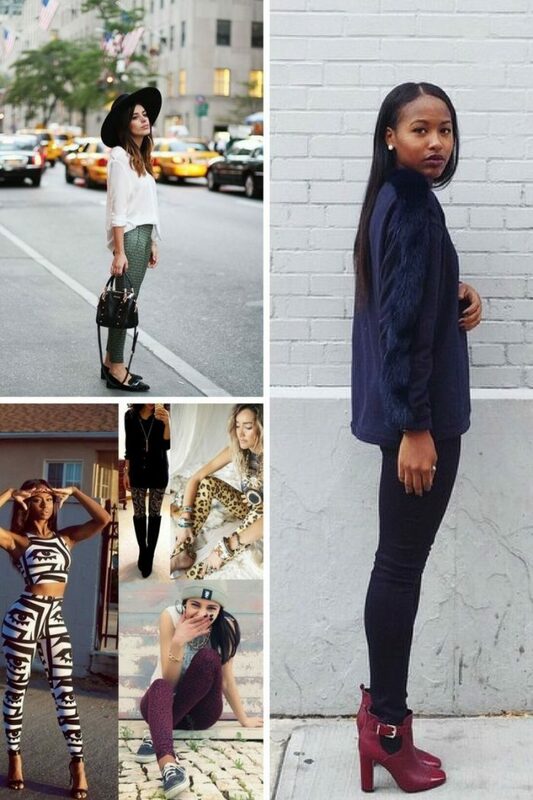 No doubt, leggings are super comfy and easy to style. There are so many fabulous designs to choose from. We see perfect versions for lounging around the city center, rock chic essentials ideal for parties, as well as printed designs, to wear anywhere you want. All in all, let’s have a close-up look at some of my favorites. All you have to do is just keep on scrolling down your mouse. The first pair of leggings I wanted to mention are black color version. They look basic, versatile and wearable. I other words saying, black leggings are perfect for anything and everything. In other words saying, this is a go-to pants that I can wear anywhere I want, starting from home to work and casual street walks around town. All you need is to invest in good quality black leggings. You can pair them with casual white T-shirts and ankle-boots, or keep things mannish by teaming with charcoal top and gingham shirt, etc. Our next stop is jeggings. They are hybrid bottom garment that is something between leggings and skinny jeans. Jeggings come in almost every color choice, starting from dark, light, medium and acid wash. As you can see, they do look like skinnies, but they are more stretchy. Our next stop is printed leggings. No matter, if you do like graphics, plaids, stripes, polka dots, florals, there is all kind of styles for any taste. Personally, I would recommend floral leggings by pairing them with loose-fit grey pullover and heeled sandals. But you can choose black-and-white tribal graphic print leggings by pairing with elongated black tee and tucking them into knee-high brown leather boots. 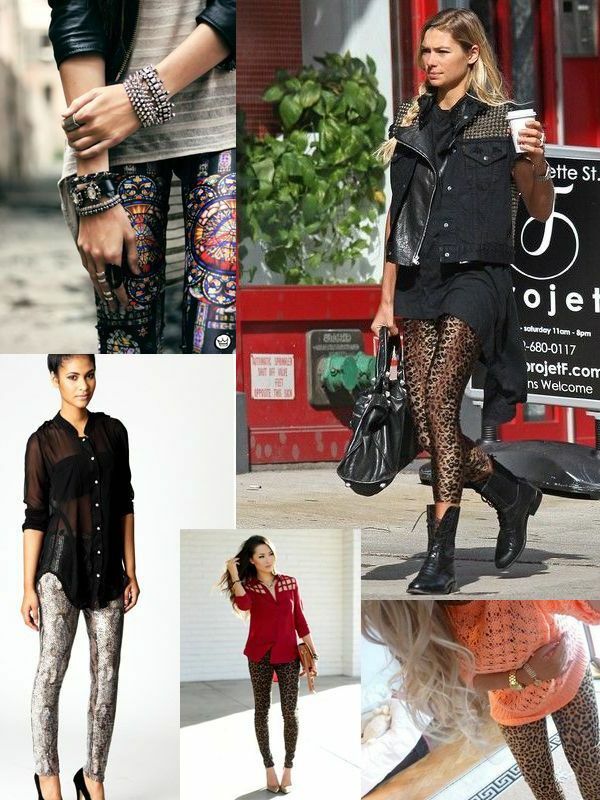 Are you in love with edgy looks? If so, then I recommend to try on leather leggings. This garment is ideal for creating ladylike, but still kickass vibe. You can give them a more laidback look by wearing with casual tees and jackets. I am so in love to see ladies wearing black leather bottoms paired with loose-fit cozy knitwear. And the last style of leggings I wanted to mention is statement-making design. They are made for creating a statement look and making heads turn. You can choose gold sequined styles and pair them with slouchy long-sleeve knitwear tops or keep things bold by teaming gold shiny leggings with loose-fit knitted sweaters, etc. Do You have any thoughts about Favorite Leggings For Women? 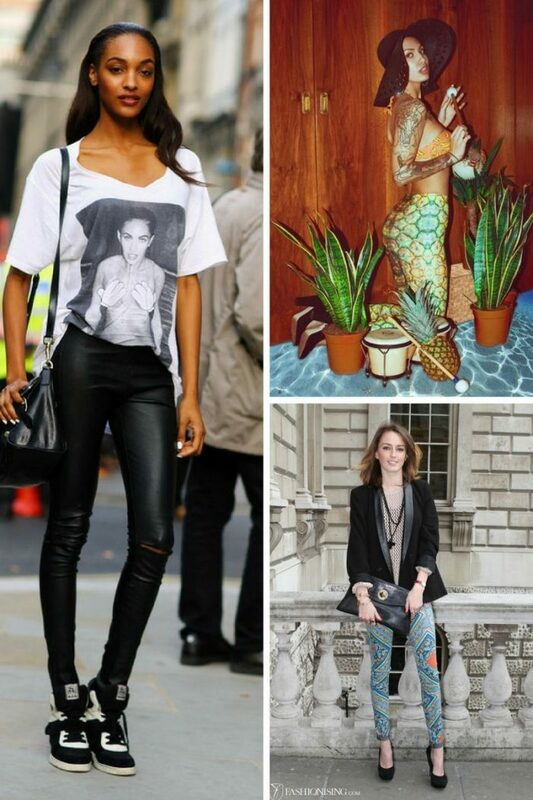 Here are Fashion Tips pictures and trendy women’s outfits which are in style in 2019: Black Leggings, Leather Leggings, Leggings, Must Have Fashion Trends For Women, Printed Leggings, Street Style Women's Fashion And Inspiration and tips on how to wear them on the streets.